I'm currently closing out the first wave of being a bridesmaid in my life. You know, the 2-3 year period of your life where all your close friends get married? I've bought plenty of bridesmaid dresses and also have picked them out for my own big day later this year, so I'm pretty comfortable in stating that the wedding industry is truly predatory. Brides often need everything to be perfect, at the expense of everyone's wallets & sanity (including their own). Flowers suddenly need to be light pink, not medium pink, ivory table cloths costing 2 times more than white get rationalized. But worst of all can be bridesmaid dress shopping! Mass produced, completely basic dresses that are marked up about 400%, all because they can. And then brides try to fool themselves into thinking their girls can wear said dresses again, as if silk shantung is ever seen outside a wedding party on someone under 60! Please don't think I'm blaming the brides though, it's the industry that really angers me. Because even the most interesting dresses are pretty boring! It makes sense, since they need to flatter multiple body shapes and appeal to wide range of tastes. But when are brides going to get sick of their wedding parties looking exactly the same as everyone else's? SERIOUSLY??? I mean, my jaw totally dropped. 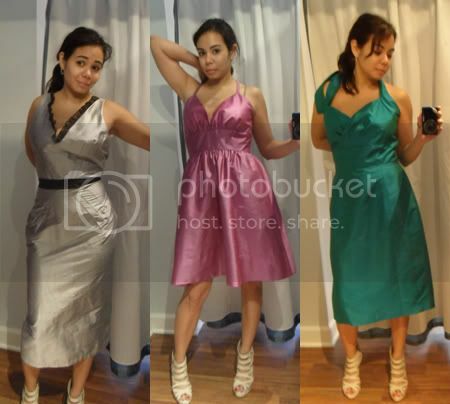 To put it in perspective, these dresses cost about the same as a cocktail dresses I've seen by Halston Heritage, Vera Wang Lavender Label, Carmen Marc Valvo and more! I'm totally with you. When I got married I just said to pick dark green. I even found some cute-ish ones in a catalog since my 3 ladies were in different cites. In the end, my mom over-rode me and paid for McClintock dresses but I was perfectly fine with the less pricey ones I found. Nowadays I'd say get a cute dress from JCrew and be done with it. I bought my bridesmaids their dresses from a sale on beyondtherack.com and I love them! The girls love them too. Since they are floor length gowns maybe they won't wear them again but they all said they feel beautiful in them and for $75 each I'm ok with the wear only once!